AMD released the second generation of their Threadripper processors in August 2018, starting with the 2990WX which doubled the number of CPU cores available in this product line from 16 to 32. This is the first desktop-oriented processor with 32 cores, and as such it performs very well in CPU-based rendering. This trend should continue in the multi-core performance test within Cinebench... but that is only part of the story for users of Cinema 4D. Aside from rendering, almost everything else in C4D - modeling, animation, simulation, etc - is single-threaded. How well does Threadripper 2 handle that sort of workload? Let's find out! To put the new Threadripper 2990WX's performance in Cinema 4D into perspective, we are also taking a look at the flagship of the first generation: the 16-core 1950X. In addition we have results from several of Intel's Core series processors, ranging from 6 to 18 cores, to compare them to on the latest release of Cinebench. The i7 7820X and i9 7900X results were pulled from previous Cinema 4D articles. You might notice the asterisk on the 2990WX's score up there: we got some conflicting results on that test, when using different motherboards. These results are from a new board from MSI: the MEG X399 Creation. It is part of a new crop of boards, releasing alongside Threadripper 2, which are supposed to be better able to handle this processor's high power draw. Older X399 motherboards should also be able to run these chips, though, so we ran both the 1950X and the 2990WX on a Gigabyte Aorus Gaming 7 board as well. The older 1950X CPU gave effectively the same results on both platforms (within about 2% of eachother)... but the new 2990WX scored much better on the MSI board in the single-core test. That is the result shown above, 167.8 points, but on the Gigabyte Aorus it only got 146.4 points. That is nearly 15% slower, which is a sizable drop in performance. This discrepancy was limited to the single-threaded test, though; on the multi-core test the two boards were within about 2% of each other again. I am suspicious of that difference, but it was verified through repeated testing. It may a result of the claimed improvements to power handling, though it seems odd for that to show up in a single-threaded test... which should draw less power than when all the cores are working. It could also be some difference in the BIOS or default settings between the MSI and Gigabyte motherboards. 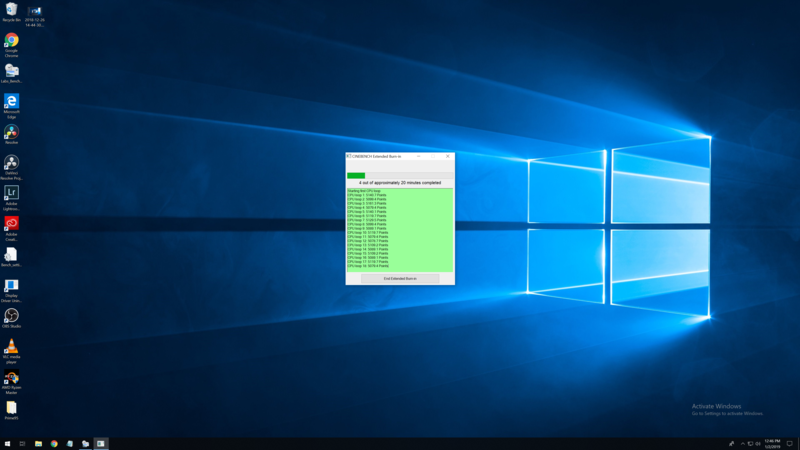 I did make sure they were using the same version of Windows, the same drivers, the same memory speeds / timings, etc. The first graph above, showing multi-core rendering performance, highlights Threadripper 2's strength. In applications like this, where every core can be put to use at the same time, the 2990WX and its 32 cores absolutely trounce every other single-CPU configuration currently available. It is about 70% faster than the older 1950X, and 50% faster than Intel's Core i9 7980XE... even though the 2990WX is 10% less expensive ($1799 vs $1999). For pure CPU-based rendering, AMD's Threadripper 2 is nothing short of fantastic. Unfortunately, single-core performance is a different story. AMD processors generally don't have as high of clock speeds as Intel chips, and also tend to be a little bit behind on instructions per clock (IPC), and that shows here. The Threadripper 2990WX falls behind all of the tested Intel processors in the second chart, which means that general performance within Cinema 4D for modeling, animation, and physics simulations will all be much slower on Threadripper (first or second gen) than on competing platforms. Just how important that is will depend on each user's workload. Someone doing primarily the design and animation side of things, with very little actual rendering, would be much better served by a processor like Intel's Core i7 8700K. Likewise, those using a different rendering plug-in - especially one that uses the GPUs instead - could benefit from higher clock speed more than an abundance of cores. In the case of animation, results will vary. For scenes with just a little, pre-scripted movement between each frame - and especially if the resolution being rendered to is very high - the great multi-threaded performance will win out. On the other hand, users with complex physical simulations happening between each frame may find that the single-threaded nature of those calculations slows Cinema 4D down so much that some of the Core i9 options would actually finish rendering the full animation more quickly. AMD's new Threadripper 2990WX is a mixed bag for Cinema 4D. If all you care about is single-frame render times, then it is the fastest single-socket processor available... by quite a wide margin. However, if the speed of working on modeling, animation, and simulation is just as important then AMD's slower single-core performance may keep this CPU from being the right choice. Because of that, we are going to keep our Cinema 4D workstations on other platforms for the time being. You can see the systems we recommend below. If you want a dedicated CPU rendering box with AMD's Threadripper, though, we can provide those too - just check out our V-Ray Threadripper system. The 2990WX should be available there soon, once it passes our hardware qualification process. Would be good as well try tests with more that one application running at once, to see the real value of this little monster. Multi-program tests sound good at first, but present some problems. For example, it is very hard to ensure that the various programs are running the same sort of workload at the same time across different platforms, which if not done correctly can skew results. Additionally, there are virtually infinite possible combinations of different software packages to run - how do you decide which combos to do, and which not to? There are even more potential problems, but those are enough to keep us from doing much in the way of multi-tasking tests. Looking forward to seeing the tests of the new chip with Resolve. Especially for R3D decoding . Matt, who handles Resolve, is on vacation this week - but you can probably expect articles from him covering Resolve, Premiere Pro, and After Effects before the end of the month. add Vegas! better option than premiere for amateurs due to the lack of monthly fees IMO. There are a lot of switches on that processor. It would be interesting to see the performance differences in different modes. E.g. What does the single thread performance look like in 1/2 mode, and how much does it improve with Precision Boost Overdrive turned on. Also, something I haven't run across yet - can you turn PBO on in 1/2 mode. If so, that should produce the best single thread performance without the need for a 500W water cooler. From what I can see, we are in the very early stages of understanding this processor. Microsoft may adjust the their scheduler to better optimize its performance, and they may drag their heels, but the mode switching does seem to radically change the behavior of the processor. Early reviews suggest that in 1/2 mode, it looks a lot like a 2950x and that would make it better for most tasks other than rendering. Bottom line, for someone willing to do a little mode switching, this processor may be a better fit for a lot things than it appears at first glance. We may know a little more when Ian over at Anandtech finally gets finished with his review :-). It seems like the niche for the 2990WX is going to be doing a different rendering workloads at the same time, or rendering something while editing another on the same machine. Why are you still using 8x Crucial DDR4-2666 16GB? All AMD CPU's like fast Ram and I will suggest you to use at least DDR4-3200. 86% of the singlecore speed of the i9 honestly is not bad at all. Some time ago I went dual xeon v3 for a mixed load of rendering and modelling in several 3d and cad apps; the single core speed is very workable, and it's not even as fast as the 2990WX. Thank you for sharing your experience! I would be very curious how you (and others who use these types of applications) determine what an acceptable level of single-core performance is? Trying to benchmark the modeling & animation side of things in programs like Cinema 4D is something I've struggled with. You are right, it's hard to objectively benchmark the singlecore oriented modeling/working/etc experience. It's very load and user dependent. To be honest, max singlecorespeed is always nice. Rebuilding in solidworks, importing and exporting models etc is nice to do at maximum speed possible. Geometry setup during rendering of a heavy vray scene is singlethreaded and can take some time... But you balance it with multithreaded demands. General modeling with heavy scenes is also about scene management and properly hiding stuff. A little context, I work an a dual 18 core 2696v3 with allcore 2,8ghz and a max turbo of 3,7ghz. MS fixed the scheduler in 1803 so I finally have better core loading and higher turbo's again.. Cinebench singlecore of these cpu's is around 150, and it's very workable allround with very nice rendertimes. (Altough with these chips and so many cores, I was not seeing a lot of difference in vray with heavy scenes with 72 vs 64 threads, I have 4 cores turned off now) You feel that general desktop work could be a little snappier. Before I always worked on overclocked i7's with an extra render machine next to it, this is way more practical. AMD changed a lot when they started pumping cores. A little later and I would probably have gone overclocked intel i9 18 core, or threadripper. The 2990WX should be seen as a dual-xeon-on-a-chip with it's strengths and weaknesses similar to dual xeon setups. It's got more single ánd multithreaded power than my xeon's so I would go for it. Regarding the difference between the motherboards, could it be that the older one does not have the Precision Boost Overdrive and XFR2 enabled? These are features for the Zen+ chips and I wonder if the BIOS does not implement on the older X399 boards, hence the single thread boost on the MEG creation board. After some further testing by another gentleman here, it does not seem that PBO or XFR2 are the issue. Those both work to enable clocking a chip even higher than AMD's official boost clock speeds, but what seems to be happening is that the 2990WX is not passing 3.5GHz - regardless of the number of cores in use - on the older Gigabyte motherboard we used. On the newer MSI board, which is supposedly built to handle the new TR2 chips higher power draw, the clock speeds are able to go higher when only a few cores are in use... which is why the single-core scores turned out to be higher when using that motherboard. This is amazing. We may, for the first time ever, move to ryzen amd cpu. Just beware of other, single-core (or just less-threaded) applications. There is definitely a trade-off with these processors, so it depends on what matters most to you. As you can see, our results were right in line with those of other reviewers in both single- and multi-CPU testing. That means that the 2990WX was able to boost its clocks fully! Had the boost speeds not reached those levels, we would not have had as high of scores as the other sites... especially considering that we were sticking closer to AMD's specs than most, and using a full set of eight 16GB 2666MHz memory modules (when a lot of reviewers and enthusiasts prefer to use less but higher clocked memory). If you still don't believe us, that the Corsair H80i is sufficient for cooling a 2990WX at stock clocks (including boost), I can fire our testbed up after the holidays and get video showing the turbo clocks in effect and the temperatures at safe and stable levels under full load. But the info presented above (and sources cited below) should be proof enough for an informed reader to understand that we have been testing these AMD processors fairly. And where all of their cores can be fully utilized, they perform amazingly well! Cinebench's Multi CPU results are a great demonstration of that, even when run on a humble, single-fan radiator. Would be interested in results after holidays. Also in comparison to a higher end cooler. 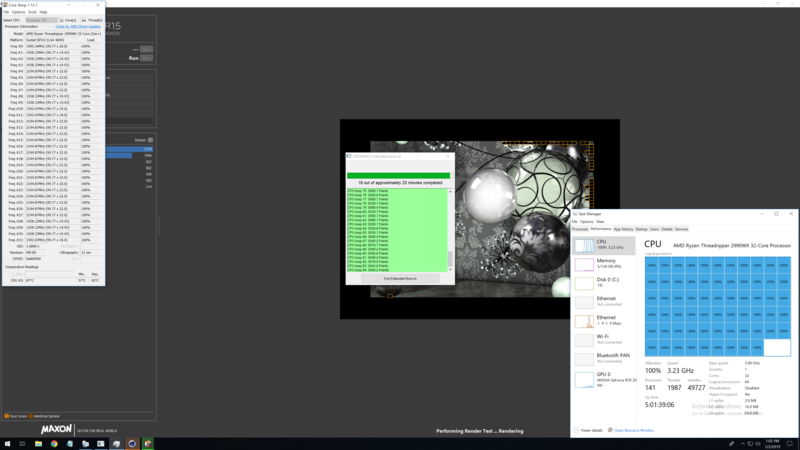 I tried getting a video, but the overhead from running OBS, CoreTemp (for temps) and Task Manager (for clock speed) at the same time as Cinebench was causing scores to drop by 100-150 points compared to where they should have been (because those apps were stealing away some CPU cycles from Cinebench). Also, it is pretty boring to just have that running for 20 minutes with nothing much to say. 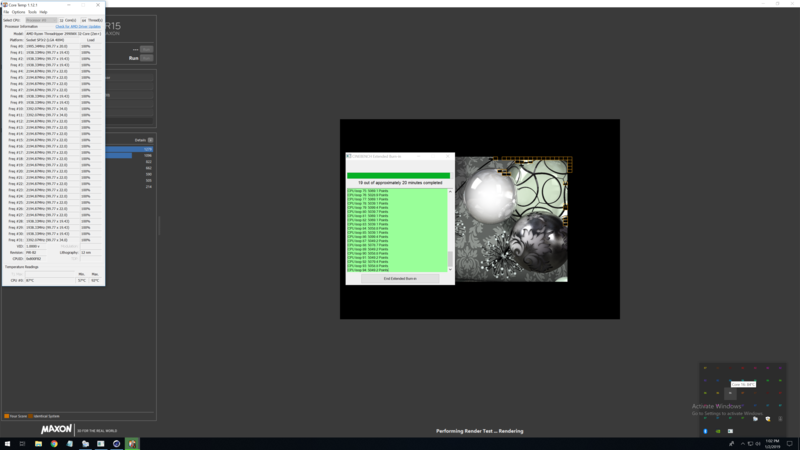 So instead, I got a screenshot from the first few minutes of Cinebench looping, showing the early run scores, and then from near the end - after close to 20 minutes of the multi-CPU test looping constantly. You can see that the variance between the highest and lowest scores is only about 2%, which implies that the performance is being maintained quite well even under heavy load with the H80i cooler. Temps maxed out in the low 90s, but then once the fan kicked into full gear they evened out in the upper 80s (Celsius). The CPU was keeping up a 3.2 - 3.3GHz boosted clock speed, which sounds about right for the all-core boost speed (base clock is 3GHz on the 2990WX, and max single-core boost is 4.2GHz). Unfortunately CoreTemp doesn't refresh clock speeds in real-time, but I was able to use Task Manager to see the current clock speed. See screenshots below. Picked up a few other things with your testing methodology. I do think that perhaps all these issues may have simply been a complete oversight by your testing team. I initially raised Principled Technologies affair as I saw many similarities and I initially was totally gob-smacked at your testing methodology. I was not suggesting that this was intentional by your testing team, and do think it's possible it was simply an oversight. At this point I think it's best we take the conversation private. I will complete my own investigation on recent benchmarks and provide feedback via email. Please advise which email would be best. labs@pugetsystems.com is probably the best email address to use, but keeping communication (including criticisms) public in these article comments is fine too - so long as it is respectful on all sides.